This recipe has been on my list to try for years now? I don’t know why we waited so long! Would you believe I made it 2 weeks in a row this past month? LOL! Guess we are making up for lost time! We used spicy breakfast sausage so we left out the black pepper and you could DEFINITELY sub the sausage for 6 thick cut slices of bacon, cooked and crumbled. We love to use a REALLY sharp cheddar cheese for this recipe! Please make this next weekend for an epic brunch! Allow pie crust to sit at room temperature for 15 minutes before preparing you brown sausag, shred cheese and chop spinach. Whisk the eggs together. Add heavy cream, salt, and onion powder. Place crust in the bottom of a deep-dish pie pan and do not poke holes in it. Sprinkle half of the chopped spinach around the bottom of the crust. Top with half of the cooked sausage, and half of the shredded cheese. Repeat the layers again, beginning with the rest of the spinach, followed by the sausage, and cheese. Pour egg and cream mixture into the pie crust over the layered ingredients. Bake for 35-45 minutes or until egg mixture is firm and the top is golden. 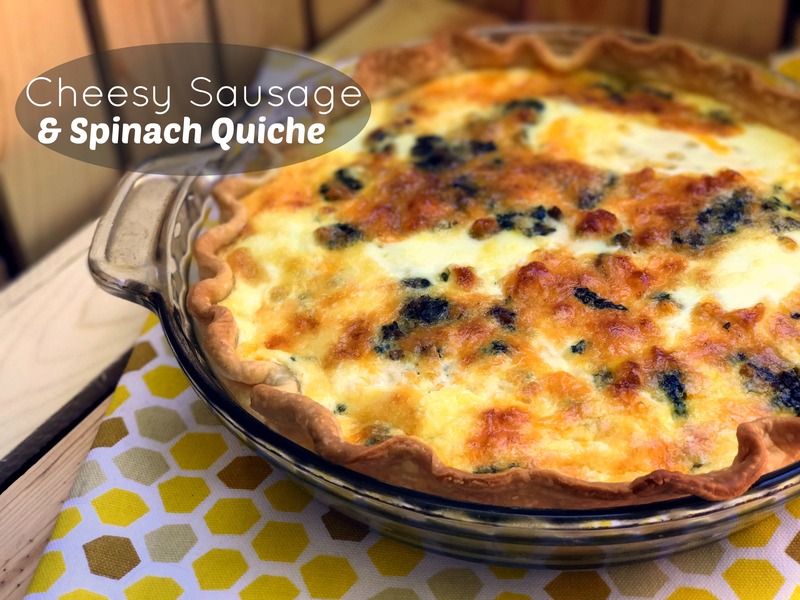 Quiche is one of our family’s favorites — I have quite a few recipes for it myself, but nothing like this one!! Totally trying! Yes you can but squeeze well but I use the frozen one but make sure squeeze well and before I add I dab a paper towel just to make sure. A good addition is canned or fresh mushrooms too.